As a mom, especially a stay-at-home-mom that is a food allergy mom AND a homeschool mom…sometimes I just love to get away and walk the aisles of my local Walmart. No one yelling, “Mommmmm!!!”. Just me and my thoughts. I like to take my time and just mosey down aisle by aisle. If it’s been a terribly stressful day, I literally will walk every aisle of the store, even the automotive section! Pumpkin Spice, Disney, and TEAL Halloween! This week was an especially rewarding getaway. My favorite time of year, as we transition from one fun holiday, into another. I found pumpkin spice everything, much of which was peanut free – yassssss! Then I came upon the Disney sections of children’s clothing, and I couldn’t stop myself from grabbing all the cutest pajama’s, baby outfits, and kids’ graphic tee’s. Gimme all the Disney! However, the surprising absolute highlight was when I ended up in the Halloween section. 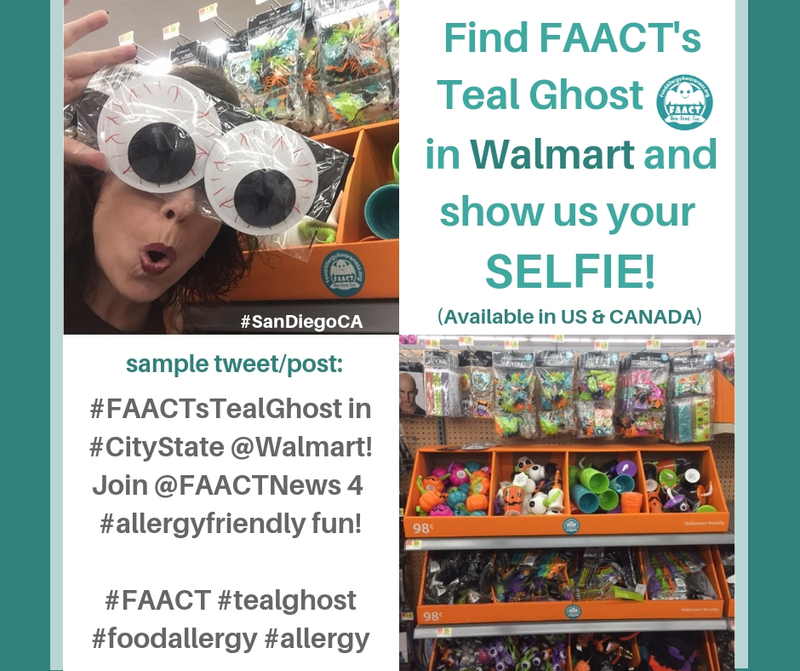 FAACT’s Teal Ghost Non-Food Fun for the Win! I knew I would love practically everything in the Halloween section, as it is one of my most favorite holidays. Heck, Halloween isn’t just one of my favorite holidays, it’s one of my most favorite things period! In the section with non-food treats there was a familiar color and logo – TEAL! TEAL! TEAL! T-E-A-L! And it wasn’t just any teal logo, it was the FAACT logo! “Non-Food Fun” indeed! Plus, it had the web address directing anyone curious for more information about food allergies and this awesome little sticker, www.FoodAllergyAwareness.org. Even though food allergies are one of the fastest growing epidemics and can literally take a life with just one bite, it seems that for as long as I have been a part of this community and cause (since 2009), we have had quite the uphill battle. To see awareness, education and advocacy in such a mainstream place as Walmart, and in one of the hottest spots in all the store – the Halloween section!!! This is really HUGE for our community and our cause. HUGE! Food Allergy Win! Thank You Walmart! Thank You FAACT! Besides the fact that this is a win for the food allergy community, it just felt good … it felt good to feel validated as a food allergy mom. So often I feel like I am begging and praying for people to “be on our team”, to understand, to have empathy, or at the very least, some resemblance of sympathy. This display was so much more to me in this moment. I love Walmart, and I love FAACT, for doing this! Lisa Horne earned a Bachelor of Science in Business Marketing and worked as an On-Air Radio Personality (AKA a D.J. ), Traffic Reporter, News Anchor and Reporter. Lisa has a child with food allergies and is the founder of Food Allergy P.I. Blog. Follow Lisa’s blog here.